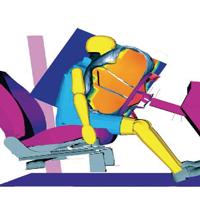 In order to reduce the cost of testing their airbag restraint systems, ASL is using Virtual Product Development tools such as MSC Dytran. MSC Dytran offers the advantage of coupled Euler-Lagrange analysis, allowing combined structural and gaseous fluid simulation. Contact analysis is very important in simulating an airbag deployment, and MSC Dytran provides a number of options for defining contacts. For ASL, MSC Dytran has proven to be a robust tool that can be applied to the design optimization of vehicle occupant restraint systems for both crash and out-of-position scenarios, which are relevant to the restraint system designs of the future. The cost of testing airbag restraint systems is growing, because government and industry regulatory groups are phasing in testing requirements for a wide group of drivers and occupants including large males, small females, and children. Some of these tests involve out-of-position (OOP) testing without safety belts. MSC Dytran provides coupled Euler-Lagrange analysis, allowing combined structural and gaseous fluid simulation. The Lagrangian method is used for structural components that may undergo large deformations and for which the dimensions, deformed geometry, and residual stress state are of major importance. The benefit of the Lagrangian solver is that the displacements, deformations, and stresses in structures can be monitored with a high degree of precision. The benefit of the Eulerian method is that complex material flow can be modeled with no limit to the amount of deformation.